Above is one of his graphs (the red arrow is my annotation). 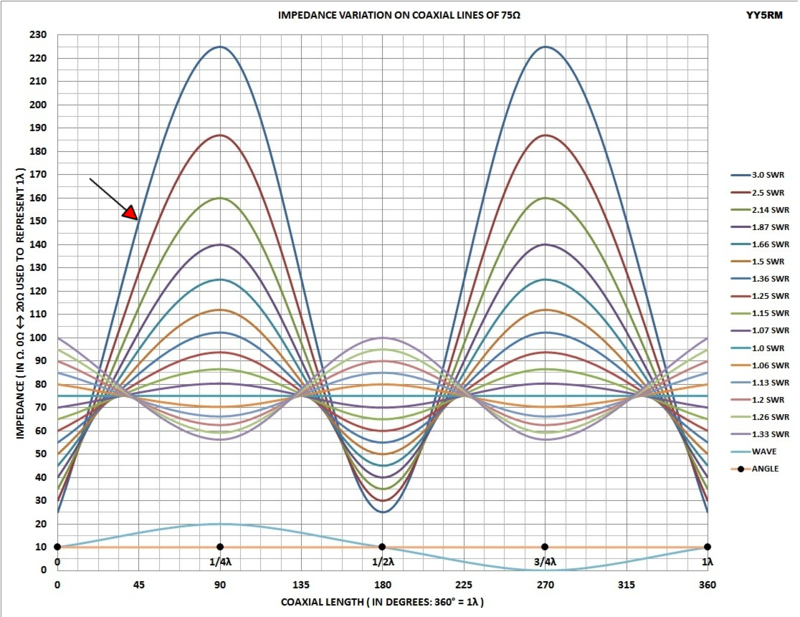 It plots Impedance variation along a mismatched 75Ω transmission line. The curves look graceful, but are they science or just pretty artwork? The first issue is that Impedance is shown on the Y scale as a scalar value, so its meaning is questionable. Taking the case of the SWR=3.0 curve, Impedance at the left hand side is 25Ω, so because Zo=75Ω and VSWR=3.0, we can deduce that impedance is in fact 25+j0Ω and 25Ω is a valid short way of writing that. We can deduce also that where Impedance is shown as 225 and VSWR=3.0, that impedance is in fact 225+j0Ω and 225Ω is a valid short way of writing that. Now let’s consider the case identified with my red arrow. If Zload is 25+j0Ω, then the impedance looking into 45° of lossless 75Ω line can easily be calculated to be 45+j60Ω or 75∠53.13°. The plotted scalar value of 150Ω is nothing like any of the components of either the cartesian or polar form of the actual impedance. Well, the graph is plainly mathematically wrong, clearly not science, and conclusions based on it are probably a case of garbage in / garbage out. 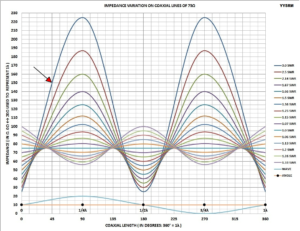 The plot above of the same VSWR=3.0 scenario from W9CF’s tran calculator shows the cyclic variation of R, X and |Z| over one wavelength of line. It can be seen that the shape of the poster’s plot is nothing like the shape of any of these curves.